In a previous post, I described in general some of the relationships that could exist between and across a large organization’s sub-contexts. What follows is a short description of some actual observations of how the need for regional autonomy in the examination and collection of taxes affected the use of software data structures at the IRS. Contexts lay claim to individual elements of a syntactic medium. A data structure (syntactic medium) used in more than one context by definition must contain meaningful symbols for each context. Some substructures of the data structure may be purposefully “reserved” for local definition by child contexts. In the larger, shared context, these data structures may have no meaning (see the idea of “traveller” symbols). When used by a child context, the meaning may be idiosyncratic and opaque to the broader context. One way this might occur is through the agreement across different organizational groups that a certain structure be set aside for such uses. Two examples would include the automated systems at the IRS used respectively for tax examinations and tax collections. Within the broad context defined by the practitioners of “Tax Examination” which the examination application supports, several child contexts have been purposefully developed corresponding to “regions” of the country. Similar organizational structure have also been defined for “Tax Collection” which the collection application supports. In both systems, portions of the syntactic media have been set aside with the express purpose of allowing the regional contexts to project additional, local meaning into the systems. While all regions are contained in the larger “Examination” or “Collection” contexts, it was recognized that the sheer size of the respective activities was too great for the IRS central offices to be able to control and react to events on the ground in sufficient time. Hence, recognizing that the smaller regional authorities were in better position to diagnose and adjust their practices, the central authorities each ceded some control. What this allowed was that the regional centers could define customized codes to help them track these local issues, and that each application system would capture and store these local codes without disrupting the overall corporate effort. Relying on the context defined and controlled by the central authorities would not be practical, and could even stifle innovation in the field. This led directly to the evolution of regional contexts. Even though each region shares the same application, and that 80 to 90% – even 95% – of the time, uses it in the same way, each region was permitted to set some of its own business rules. In support of these regional differences in practice, portions of the syntactic medium presented by each of the applications were defined as reserved for use by each region. Often this type of approach would be limited to classification elements or other informational symbols, as opposed to functional markers that would effect the operation of the application. This strategy permits the activities across the regions to be rolled up into the larger context nearly seamlessly. If each region had been permitted to modify the functionality of the system, the ability to integrate would be quickly eroded, causing the regions to diverge and the regional contexts to share less and less with time. Eventually, such divergence could lead to the need for new bridging contexts, or in the worst case into the collapse of the unified activity of the broader context. By permitting some regional variation in the meaning and usage of portions of the application systems, the IRS actually strengthened the overall viability of these applications, and mitigated the risk of cultural (and application system) divergence. The following figures depict some notional ideas for how to graphically describe some of the interesting relationships among contexts as they occur in a large, formal organization. The idea occurred to me that there must be some way of describing the similarities and differences in the concepts and discourse of the various subgroups of an organization (any organization). In the diagram, each oval represents a defined organizational group established by the business to allocate and accomplish all of the work necessary for the business to function. Each oval within another oval represents a specific group of individuals working in that business, until we reach the largest oval representing all employees in all groups. Even this largest oval exists in a larger context, that of the culture at large. The discussion which follows touches on some incomplete ideas about how the concepts, signs and symbols within a given context relate to those of both smaller child and larger parent contexts. “Inheritance” of concept flows down from the broadest context down to the lowest context. This is not like the inheritance of properties in an object oriented paradigm, so the term may need to be changed. The idea really is that in the absence of an explicit statement of a concept in a lower level context, the members of the community may defer to the definition of that concept from one of the broader contexts that exist above them. In other words, the larger community of humans may have defined the concept and the more detailed context may neglect to reiterate the concept, preferring instead to use the larger context’s definition. On the other hand, any concept defined in a broader context may be re-defined at a more detailed level. This may or may not be intentional, or even noticed by either members of the larger context or the more insular context. When noticed, it still doesn’t typically cause a problem in normal human discourse, as the humans are able to translate between each context, and hold in their minds each definition. Contexts at different levels that do not share the same lineage may define a concept in different ways. If their members do not interact under normal circumstances, then there is still not a problem of communication or data integration. However, problems arise out of this layering and locality-driven conceptualization when the information must be shared, either tete-a-tete through direct interface (as happens in workflow integration problems) or through some roll-up to a common conceptual, parent context (as happens in reporting and business intelligence problems). This is the origin of the “single version of the truth” goal that many organizations now take as a given, best practice. “Inheritance” of concepts flows down. What this means is that concepts defined in the parent’s broader context may still hold meaning in the more narrow child context. Exceptions/replacements are not limited to replacing concepts from the immediate parent, but can happen with any concept above. Each context layer, almost by definition, will define concepts that are uniquely their own, as well. This is one of the sources of intra-organization argument and confusion, as the same terms (syntactic medium) may be used to refer to two slightly (or even grossly) divergent ideas within the same corporate context. Not every symbol will be meaningful in every child context, the process of transference of concepts can filter out concepts as well as borrow them. 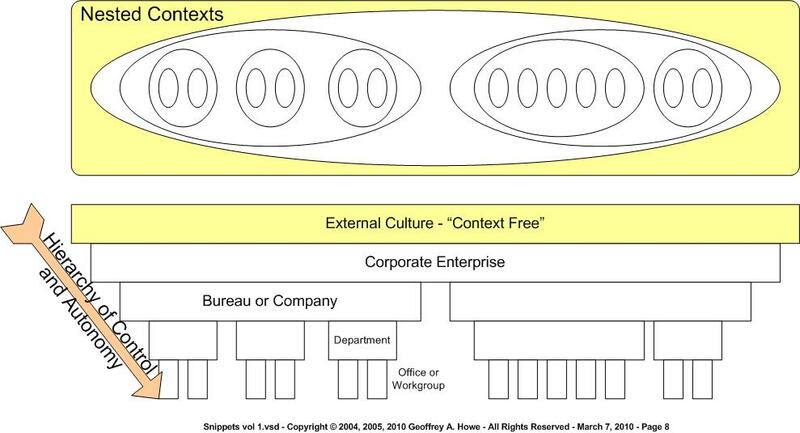 At each contextual layer, shared structure may be given different meanings. Lack of specificity/explicitness of definition at a layer does not imply automatic inheritance from above, as it can also reflect a vagueness of thought or lack of agreement about a fringe aspect. The vacuum created, however, tends to favor the wholesale borrowing of the concept from the parent context. Each context layer is complete in its own right. The sizes shown in the diagram suggest a size of content but this is just an artifact of the notation. A child context may define an infinite number of concepts over time, just as its parent context does. Theoretically, each context could be depicted or described in full without reference to the broader parent contexts. Not every concept defined within any particular layer will wind up represented within some application software used by the humans participating in that context. However, if the humans in that context have acquired software to support their activities, the concepts within that system will naturally conform to the context, although they may force the context to be changed to reflect limitations and capabilities that the software imposes. The reality is of course much more complicated than the diagram suggests. Since the context at each level is defined by the humans who inhabit and communicate within it, new members may introduce or adapt concepts from other contexts that are unrelated to the hierarchy of autonomy and control. Rather than attempt to trace the origin point of concepts across all contexts, it is recommended that these few concepts be considered either of local origin, or as part of a bridging context between the context and the context of origin. This will have to be chosen only based on the value to be gained from either point of view. 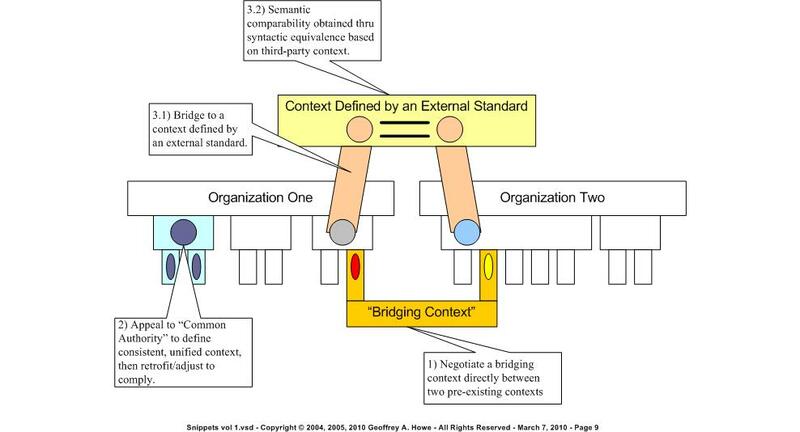 Bridging contexts are new contexts established to bridge between some subset of concepts from each of two different contexts. These are established when new information communication between the two contexts is required. The bridging context can be recognized by the relative sparseness of the conceptual inventory, and by the fact that the lineage of the concepts is limited to two (or perhaps a handful at most) otherwise disjoint contexts. Most transaction oriented interfaces, as well as any data interface between two functionally disparate systems (of any type) are defined within a bridging context limited to just the mediating symbols.